The idea that a photographer should be compensated for promotional / corporate use of their images is no more absurd than thinking that a plumber should be paid for fixing your sink or that a carpenter should be paid for building your kitchen cabinets. Sadly, this point has never really stuck. Social media has made photography and video more accessible than ever, and unfortunately, this accessibility is sometimes confused with "free for the taking". As many of you know, the content I share here on Editing Luke is part of my media production business, the inception of which took place nearly a decade ago while I was in film school. After years of hard work to get this business off the ground, I now make my full-time living in promotional video production and photography. For the sake of driving home my point, I feel this needs to be emphasized. There's a big difference between me sharing content "freely" through my online platforms, and allowing someone else to use my content independently. For what it's worth, I probably receive a message like this about once a week from a different group, business, individual, etc. With a healthy social media following, steady traffic through this site, and tens of thousands of images online, I'm a pretty easy guy to find. However, this message rubbed me the wrong way for several reasons. First off, Travel Alberta is one of the biggest tourism groups in Alberta, the province I call home and operate my business within. Not only do they have a sizeable marketing budget, but they are also the very organization that you'd expect would be supporting Alberta based creatives. Over the years I've been in touch with them a few times about collaborating and offering them image packages from my growing travel library from around Alberta for purchase. They've never taken me up on my offers, and have told me directly that they don't pay for images. All of this is fair game. I'm not offended if they don't want to purchase images from me. However, it is bold of them to continue sending me, and who knows how many others, casual messages like the one above asking for free content. 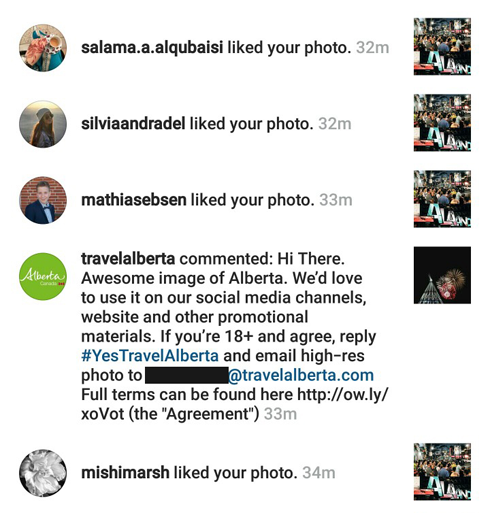 Travel Alberta's request is not about simply resharing an Instagram post, something that with credit is entirely acceptable. As is sharing my blog posts on social media, retweeting the things I share, commenting and engaging with my content, etc. etc. This is different. If you read their terms they're looking for the photographer to agree to "grant to Travel Alberta a non-exclusive, perpetual, worldwide, royalty-free license to use, publish, modify, reproduce and distribute for purposes of promotion". Essentially, allow them to use your work to promote themselves without any compensation or credit to you. As you read on it's pretty clear that they want the freedom to do whatever they please with your work, stating, "Travel Alberta retains the right to make or cause to make use, access, load, download, store, install, copy, publish, distribute, communicate, exhibit, produce, reproduce, print, broadcast, display, sub-license and/or assign (hereinafter to “use” or “make use”) the Creative Works throughout the world for any and all promotional, educational, marketing, public relations and/or editorial purposes set forth in the Travel Alberta Multimedia Library". Again, as someone who is creating original high-quality content as a means of growing his business, in what way is this a favorable arrangement? What professional would ever agree to terms that removes them from the equation and allows someone else to potentially profit off of their hard work as a result? They're literally offering nothing in exchange. Not only is this bad for creators, but it's actually counterintuitive to what Travel Alberta should be trying to achieve. You see, in the last few years I've shot travel photography all over North America and have been in touch with probably 50 different tourism boards in that time. When I'm capturing experiences and locations I'm being strategic in what I shoot, because it's not just about capturing pretty pictures, it's about recognizing a gap in the market. When Travel Alberta makes it clear that they just want free pictures, they're essentially shrinking the market. They're telling professionals that it's not worth your time to create original content tailored towards them because they don't intend to pay for any of it. As a result, less is produced. To make up for the disparity they then mine other sources, like social media, hoping amateurs and hobbyists are flattered enough by the request to give away their images for free. Obviously, organically created amateur content certainly has and always will have a place. But even then, creators should still be compensated when the goal of the company asking is to use the work to promote their own brand. Consider this alternative. If instead of asking for free work, Travel Alberta inquired about purchasing images from a variety of creators, especially those around the province, then they'd actually be encouraging more competition and growing the market for original content. They'd create more incentive for all the travel, adventure, and lifestyle photographers out there, because anytime Travel Alberta purchased images from them they'd be directly supporting the market that makes creating that content possible. This is how the industry gets stronger. Funded creators up their game and Travel Alberta gets even better content to choose from. This strategy has a variety of knock on effects, especially in tourism, where other regional markets come into play. Strong creative content is good for Travel Alberta, naturally it should be good for creators too. I understand that in this day and age everyone with a phone in their pocket calls themselves a part-time photographer, however I guarantee that you'd notice if every company only used free amateur work to promote themselves. Supporting professional creative content matters because it's the only way to keep raising the bar. If creators agree to "freebie" terms like these they are essentially agreeing to help stagnate a market that many of them are actually trying to be a part of. Requests like this from big companies who can afford to pay for content should not only be declined, they should be called out. This is not how good business is done. For what it's worth, I'm just one guy with a little media company. 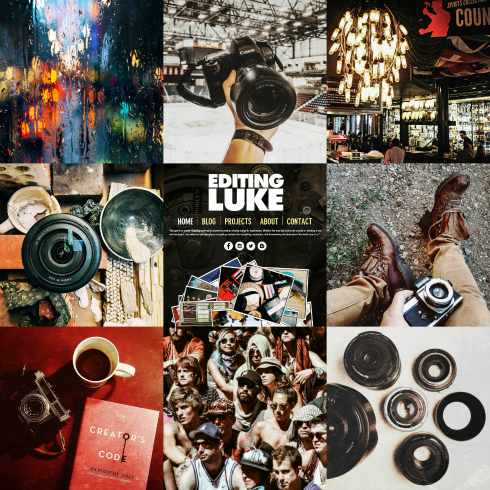 That said, in the last year my images have received over 100K likes on Instagram and over 6 million impressions on Google image searches. Let's not pretend quality content has no value.